English Summary/英文概要： Explore Rocks and Minerals! offers kids ages 6�C9 a fascinating introduction to geology. It investigates the geological forces that create and transform rocks, outlining the life cycle of igneous, sedimentary, and metamorphic rocks, and what they can tell us about the earth. It also explores fossils, and how they come to exist and are discovered. Explore Rocks and Minerals! includes 20 hands-on activities to bring learning to life. Kids create their own crystals, sculpt edible models of the planet, and bake volcanic meringue cookies. These easy-to- follow activities require minimal adult supervision and use common household products. 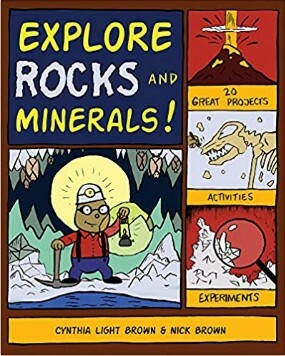 By combining an interactive component with jokes, fun facts, and cartoons, Explore Rocks and Minerals! provides a fun, accessible introduction to geology.